You should be getting used to my late night blog posts already. I apologize if this has been going on for quite some time now. My time management skills are not what they used to be. That, or I’m just insanely busy at the moment. I hope you understand! When I first got this top, I thought it was the perfect irony. Chanel has always been classic, clean and sophisticated. This top seems to want to break that image. Oh the wonders of graphic design–just a few modifications and already the iconic logo seems to be portraying a completely different image. I decided to let this top and all its irony dictate the rest of my outfit. I took inspiration from it and styled my outfit according to this concept. Another ironic pairing–leather and pearls. Who would’ve thought this 2 would ever meet and most importantly, actually look good together? Pieces like these leather shorts are treasured in my closet. They’re unexpected which makes them all the more striking. Instead of wearing booties and the like, I opted for a classic pair of pumps. Again, it’s all about the balancing act. I wanted my outfit to be a mix of classic and modern/edgy pieces–including my accessories. Little tidbit: it was actually my mom who found this necklace at H&M when we were shopping in Singapore. She had the “proud moment” kind of face when she handed it to me and told me I should get it. I was proud of her as well. Good job, mom. Good job! The only thing I don’t like about this necklace is it’s extremely heavy. But then again, it’s too pretty not to buy! Love your heels too ! Thank you Philip! It’s my favorite! How I wish! Haha1 But I’ll probably get bankrupt! LOL! Very nice! One of my favorite outfits that you made. It is not easy to pair a printed blouse with printed skirts/pants. But this is perfect! Such a lovely coincidence Camille (CC) hehehe!!! Perfect coincidence! :) Thanks Wrey! The bag…. I just died… :D Hihihihihi Love it! I love the heels and a black and white outfit! what model is your chanel bag? This is really old already. Like years ago! Adorable look. It’s so you Miss. :) I love the details of your short. I love the idea as well. I’m claiming it! Haha! :) Thanks Fifi! I absolutely love this look. The combination is so beautiful! Yes gems + pearls! :) Thanks ren! Oh!!! I’m tottally crazy about your look! 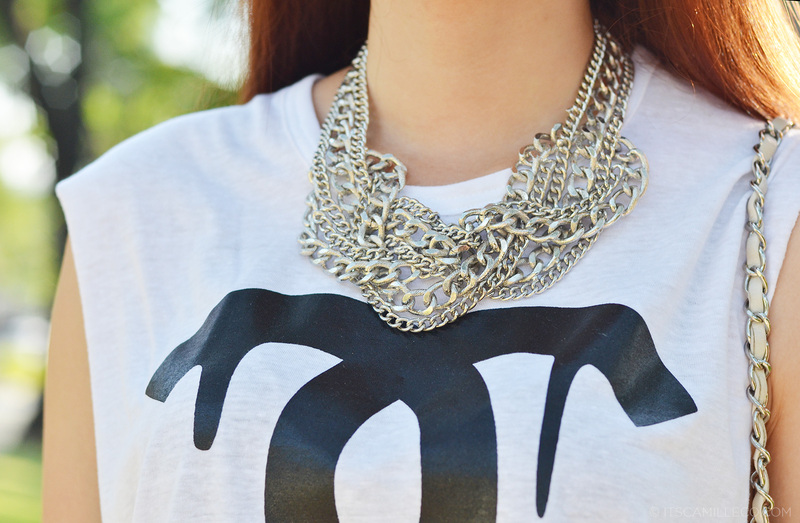 I looove Chanel, and you got the earrings, the top and the bag!!! The leather shirts are stunnig as well! No doubt its one of my fave looks!!! Today on my blog, leather is present too! Oh sorry Camille I guess CC stands for Cha Conrado. LOL jk. Anyway I was on that “proud moment” when I realized I have the same initials as you and Chanel. Oh diba parehas tayong CC? xD Anyway will you be at Candy Style Awards this May? ang bongga ng embellishments sa shorts! Thank you Nina! :) I wish you all the best! I’m used to it alright XD Very pretty! Fabulous :D!You’re the Asian Coco Chanel ;).Haha! I saw the top wore by a blogger too.. just forgot who.. hmm.. I love the pearl embellishment on your leather pants!! Your mum have great taste!! My mum also will have that proud face when she choose something nice.. We went shopping and I bought a shoe that she chose.. but I gave it to her because it’s too tight on me! We share the same taste which is we love classic piece! Mum will always be mum! 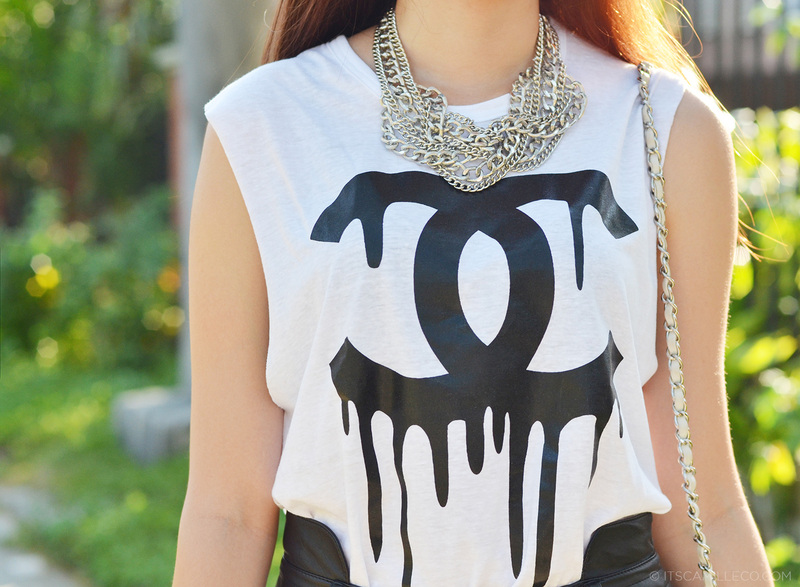 =) and I love that Chanel bag too! So cute!! Hi ate beautiful :). I always check your blog every morning for a new post, even in lookbook. :) You look good in everything you wear! Those heels are from Forever?!? I never would’ve guessed! They’re so pretty… totally want!! you’re so adorable….Is there any dress that doesn’t fit you right? Of course there are :) Thanks Reena! Sobrang kamukha na ng shoes mo yung kay Alexander Wang! And I noticed nagiging trend na ang low rise heels ah. Pero height is might parin ang peg ko! haha! parang ang hirap kasi i-pull off ng mabababang heels eh. Ang sarap kaya ng gummy worms. Not weird at all. LOL you replied to my tweet! The trimmings on your shorts are just so adorable! :D My mom also makes those proud, smug “I should be handed an award for this yknow, mwahahaha!” kind of face when she hands me things that’d look good on me, haha! Achievement daw :P How lucky are you that your initials are already on a famous brand? Unless there’s a famous store with the initials S.R. I don’t think I’ll find anything like that yet, har har! SNR? Haha! Pwede na yun! :) Just kidding :) Thanks Sephie! You’re really an inspiration to me, I love everything in this photo Ms. CC.